ABS Plastic Enclosures for Electronics and Devices. Including Handheld, Desktop, Wall Mount Enclosures and Project Boxes. DRESS IT IN A SIMCO HOUSING... AND SEE HOW GOOD YOU LOOK! ABS electronic plastic enclosures for a product or instrument are an integral part of its design, playing a key role in its value, quality and presentation perception. It should enhance and complement your product in every possible way. Enclosures that house a product are its first visual introduction. That is why it's important to pick a housing that projects the right impression for both the company and product it represents. Durability, protection and function of the electronics being housed are also important factors in the selection of your electronic enclosures. These advantages make SIMCO the most logical choice for all your needs - from proto-typing to production. 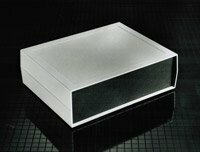 All of our IP65 ABS plastic project boxes are Reach and RoHs compliant and meet the 2002/95 Directive. They are made from quality automotive grade plastics and we offer our products in both 94VO and 94HB materials. They are perfect for desktops or work benches were visibility is important. This desktop enclosure includes molded-in pc card guides and mounting bosses for mounting your circuit boards either vertically or horizontally. This desktop enclosure comes in a range of sizes from small to large, so they will accommodate electronics for many different uses. The front and rear panels are easily installed therefore making your electrical components easier to install. These handheld enclosures are designed to fit well in your hand making them suitable for meters and handheld equipment. 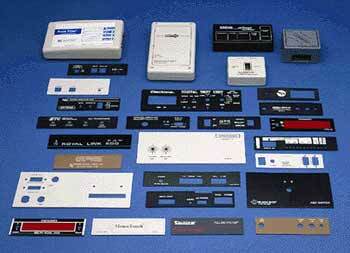 They are offered with a generous area for mounting your LCD displays and keypads. Available options also include pc board mounting bosses and several sized battery compartments. This makes them suitable for many medium sized electronic requirements. These plastic pocket size enclosures are perfect for applications that require a small enclosure that will easily fit in your pocket. They can also be used as a smaller handheld enclosure for the situations that require it. They are available with battery openings and drop-in plastic panels. There are also pc board provisions built into the enclosure. These utility enclosures offer many different sizes and configurations ranging from .625" to 2.5" in height. Enclosures included in this series are wall mount, electrical boxes, project boxes and potting boxes. They have a wide range of uses from automotive to robotics and many more. At SIMCO we know that successful realization of a products entry into the marketplace doesn't happen overnight. Days, weeks and even months can go into product research and development - that is why it makes sense to choose a company like SIMCO that is dedicated and committed to assist and support your project from inception to development. Here is an overview of some of our value-added services. Unless otherwise specified SIMCO's plastic enclosures are molded from our standard ABS material. Standard material is high-impact ABS with a flame class rating of 94HB. SIMCO also maintains a minimum stock level of product manufactured in flame retardant 94VO UL approved ABS plastic material. If UL 94VO material is required it should be specified when ordering. A Certificate of Compliance will be furnished on request. Custom colors and other materials, such as nylon for high heat applications are also available as options. For more information on these materials contact our Customer Service Department or click on the Spec Sheets link to on the top and bottom of each page. SIMCO's plastic housings and panels are easily machined or drilled to create openings for switches, connectors, displays, etc. Our high tolerance CNC machining Centers can modify any housing with cut-outs, openings, chamfers, and other assembly requirements to your exact specifications. Send us a drawing or a rough sketch of your requirements and let our design experts assist you in choosing and customizing the right enclosure for your unique project needs. Some of SIMCO's plastic project cases can be custom molded using our patented insert technique to mold openings and assembly requirements where needed. A special low cost mold can be constructed to your specifications for inexpensive custom end panels. For product identification, SIMCO can Pad Print your logo or product information to create a permanent and distinguished appearance for your product at a price you can afford. We have a wide variety of ink colors available. SIMCO can furnish enclosures that are shielded for protection against electromagnetic interference. We use a copper based acrylic lacquer coating that is extremely conductive and provides excellent attenuation and shielding against unwanted radiation and emissions. UL recognized with most plastic substrates. For more information on these materials contact our Customer Service Department or click on the Spec Sheets link to on the top or bottom of each page.